Teaching Essential Principle 5: Our understanding of the climate system is improved through observations, theoretical studies, and modeling. Teaching this principle is supported by five key concepts. The components and processes of Earth's climate system are subject to the same physical laws as the rest of the Universe. Therefore, the behavior of the climate system can be understood and predicted through careful, systematic study. Environmental observations are the foundation for understanding the climate system. From the bottom of the ocean to the surface of the Sun, instruments on weather stations, buoys, satellites, and other platforms collect climate data. To learn about past climates, scientists use natural records, such as tree rings, ice cores, and sedimentary layers. Historical observations, such as native knowledge and personal journals, also document past climate change. 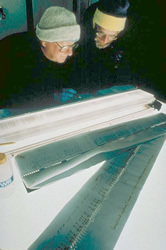 Observations, experiments, and theory are used to construct and refine computer models that represent the climate system and make predictions about its future behavior. Results from these models lead to better understanding of the linkages between the atmosphere-ocean system and climate conditions and inspire more observations and experiments. Over time, this iterative process will result in more reliable projections of future climate conditions. Our understanding of climate differs in important ways from our understanding of weather. Climate scientists' ability to predict climate patterns months, years, or decades into the future is constrained by different limitations than those faced by meteorologists in forecasting weather days to weeks into the future. Scientists have conducted extensive research on the fundamental characteristics of the climate system and their understanding will continue to improve. Current climate change projections are reliable enough to help humans evaluate potential decisions and actions in response to climate change. How data is collected through a wide range of tools and techniques. How data is rigorously checked for quality and accuracy, and what scientists mean by "uncertainty" in the data they collect. How models are developed and fine-tuned, with outputs from various models to increase the accuracy of the models. Why "peer review" publications are such an important part of the scientific research process, even though these articles are usually very technical and often hard to understand by a non-expert. What makes this principle challenging to teach? An area of common confusion that educators, students and the public have is that climate scientists disagree as to whether or not climate change is happening, or if it is happening, whether or not humans are the primary cause. There are a variety of reasons for this, but the bottom line is the vast majority (~97.4%) of scientists who study climate and publish in peer-review journals do agree that human activity is altering the natural greenhouse effect and causing the planet to warm (see the article by Doran and Zimmerman in the references section). A related confusion is that most people don't understand how climate scientists know what they know, and this partially is because scientists aren't always good at communicating their research to non-technical audiences, and partially due to the way science is communicated in the media. Another hurdle is the overall perception that science is overly challenging and that scientific understanding is out of reach for the general public. Thus, educators can take deliberate steps to illuminate how science works and how scientific research is relevant to society. How can I use this principle in my teaching? The most direct method to overcome students' misunderstanding or phobia of science is to immerse them directly in an interesting and tangible scientific question. The process of engaging in science can be accessible to all grade levels and can be brought into the classroom with a variety of approaches. Whether in teams or as individuals, learners can become immersed in the inquiry process of research, observations, data analysis, synthesis and presentation that lies at the heart of all robust science. Middle school students can practice the process of science and see examples of how data is used to reach a scientific conclusion. One activity that illustrates the scientific process is Using a Very, Very Simple Climate Model in the Classroom. Students can also follow blogs and field reports from real scientists who are dispatched to interesting locations to unravel compelling research questions. In high school, students can examine data from a widespread area to see if national data matches up with their own observations of their local climate. See the US Historical Climate: Excel Statistical. To determine how changes in climate are measured both quantitatively and qualitatively, students can analyze tree ring and ice core data and review written and visual historical records. At the introductory undergraduate level, students can engage in field projects, campus-based research, or service learning projects that conduct climate-based research. Alternatively, students can examine paleoclimate or proxy data to learn about how scientists use these types of data to uncover past climate history. For an example, see Climate and Civilization: The Maya Example. Upper-level college students can take part in more in-depth research projects such as working with large datasets (such as with the Global Temperatures activity). Students can also use climate models to understand the process of modeling as well as to study the results from the model output. The AAAS Project 2061 Benchmarks for Science Literacy illustrate connections between concepts as well as how concepts build upon one another across grade levels. Many of the CLEAN activities that teach Principle 5 fall within the scientific inquiry benchmarks. For more information see this article about the fifth principle from Encyclopedia of the Earth. Process of Science - This web resource contains 16 modules describing various aspects of scientific inquiry, data analysis, peer review, ethics and more. RealClimate - Read real-time discussions of emerging climate science and policy, written by climate scientists. Scientist at Work - A blog from the New York Times that provides a glimpse of the many challenges of conducting research in Antarctica.